When you first start out researching how affirmations work, you can run into many negative ideas about them. The internet is packed full of people insisting that they have never gotten the results they hoped for even though they have been using affirmations faithfully for a very long time. There's one thing these people don't understand. The interesting thing is, if you take a look at those sentences, you will see that each of them at its heart is an affirmation. Maybe not one you would want to deliberately confirm in your life, but an affirmations nonetheless. And boy, oh boy, are those affirmations effective for the folks who say them. The truth of the matter is that the Universe does not make any differentiation between whether what you are affirming will make you happy or unhappy. It is the process of affirming that makes those things show up in your life. A consistent stream of thoughts directed toward a particular outcome is the heart of any affirmation. The farther what you want is away from the way you are right now, the more consistent you must be in your affirming. It’s not that what you want is so difficult for the Universe to bring you; it’s that changing your habitual thought pattern takes some work on your part. Not for the world, but for you. The power of affirmations lies in consistently directing your new thoughts in a particular direction. 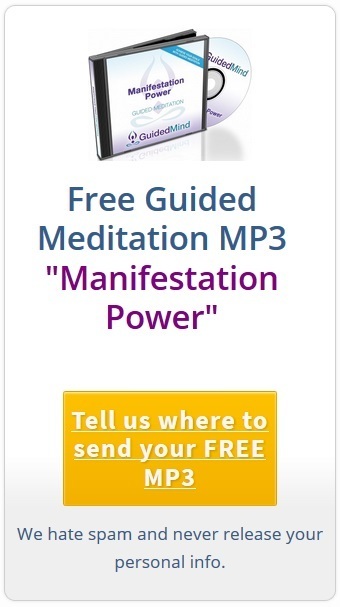 Message form Guided Mind: Use our meditation album and attain the ulitmate money mindset - as early as today! Sounds simple, and in truth, it really is, but our habits are deeply entrenched in our hearts, and we need to affirm what we want in our lives a substantial number of times before we can expect to create a new and much more positive set of thought habits. The 7 Most Powerful Money Affirmations Ever Written. Use these consistently, and you will see change in your life. Also read: Change your money mindset in mere 60 seconds - click here and do it now! True enough, you might have to search for the change when you first start out, but after a while, you will be thinking differently on a consistent basis. Then, just a relatively short while after that, you will begin to wonder how you ever thought any other way. Affirmation 1: "I am worthy of a wealthy life." The world is abundantly full of everything. There is no lack. If I perceive lack in my life, I am free to change that starting right now. I am free to replace my old programming concerning money with new, healthier thoughts, so I can share in all the abundant riches of every kind that the world has to offer. Affirmation 2: "Money comes to me in miraculous ways." Money is everywhere in the world, the amount I have is not representative of how hard I work. Money can come from my job, from investments, from gifts, from almost anywhere – I do not need to work more to get more. I am willing to think differently about receiving money starting right now. Affirmation 3: "I am deserving of abundance in my life." I am part of the Universe and I am willing to believe that the Universe is infinite and abundant. I am willing to believe that I am infinite and abundant, just like the Universe. I know I was created as a being of love, of hope, of charity, of goodness and that I am a reflection of the Divine. There is nothing in me that is undeserving of good. Affirmation 4: "I am open to receive wealth in many ways." I am willing to travel more than one path to increase the amount of money in my life. All good, all peaceful and all equally valuable. Affirmation 5: "I love my positive, happy, abundant life." I am the only person who is thinking in my mind right now. If I hear some other voice, that is a memory and is not part of my present moment. I can choose something different than I am experiencing right now and while it might feel strange to think in a different way, I am certainly entitled to do that. Affirmation 6: "The more I give, the more I receive. The more I receive, the more I give." I know everything evens out; therefore I am determined to send good into the world. That way I know I am going to be getting good back into my life. Just because I send out a message of giving does not mean I am going to be getting back a message that I need to give even more. That is not how the Universe operates. Also see: 8 other beliefs to hold in order to make more money. Instead when I give, I get back. And then I have even more reasons to give more out. It is a beautiful and peaceful cycle that works with everyone in the world. Affirmation 7: "Life is abundant and I am safe." The world is as I see it, and I am willing to see it as a safe and beneficent place to live. Others are more than welcome to view the world as full of fear and lack; I simply choose to live the way I believe. If I choose to make my life focus on abundance, happiness, peace, cheerfulness, love and plenty of every good thing to go around for everyone, then I will bring more and more of those things into my life. To get the most benefit from these affirmations, please say them, write them, sing them, chant them, as many times a day as you want. You could even create a 7 day program for yourself and use one affirmation each day. Consistency counts, but not in a bad way. Nobody is going to be following you around yelling at you if you miss a day. And you do not need to take up that task for yourself, be an encourager, not a snarky boss. That is how you can bring authentic positive change into your life. Michael Shook is known as the Internet’s Most Positive Blogger. Together with his wife, Susan, they have created ALifeOfLight.com with a simple idea in mind. They help people feel better by offering positive writing, ideas, programs, images, videos, and anything else they can think of or find online that will help you live the life of your dreams. And they do this without espousing any particular religious or spiritual tradition. Click on over to their site and try out their inspiring daily messages bringing a bit of awesome positivity into your life each day. And check out their Facebook page at https://facebook.com/alifeoflight.